After US President Donald Trump slammed Twitter for ‘shadow banning’ Republicans last year – which the micro-blogging platform said happened owing to a ‘technical glitch’ – the company is now in the thick of a similar controversy in India. Twitter will face a 31-member Parliamentary panel on February 11 which will be the first-ever hearing of a global tech giant in the country. The allegation is that Twitter has a bias against ‘right-wing’ accounts as general elections loom – serious enough for the government to call Twitter for a hearing before a House panel. This is in line with what we have seen with Twitter CEO Jack Dorsey, Facebook CEO Mark Zuckerberg and Google CEO Sundar Pichai testifying and being grilled last year by lawmakers in the US and in the European Union (EU) over data privacy, political interference and fake news. The big question is – Who will represent Twitter in the India hearing on February 11 at 3 p.m. in Parliament Complex? The company currently has an interim head in Balaji Krish who is Twitter’s global head of revenue strategy and operations after Country Head Taranjit Singh quit in September. Mahima Kaul, who is Head of Public Policy and Government, is very active when it comes to fire-fighting. Vijaya Gadde, Legal, Policy and Trust and Safety Lead at Twitter, who accompanied CEO Jack Dorsey to India in November last year, had to apologize on the ‘Smash Brahmanical Patriarchy’ poster row. The Parliament’s Standing Committee on Information Technology, headed by BJP MP Anurag Thakur, is tasked with examining several aspects related to data security and privacy. The house panel has 21 members from Lok Sabha that include Hema Malini, Prasun Banerjee, L.K. Advani, Raosaheb Patil Danve and others. It also has 10 members from Rajya Sabha that include Raj Babbar, Beni Prasad Verma and Subhash Chandra. The tech giants are in a huddle over the abuse of their platform, especially when the elections are inching close. Twitter told IANS on Wednesday that it is in touch with the Indian government on the issue. 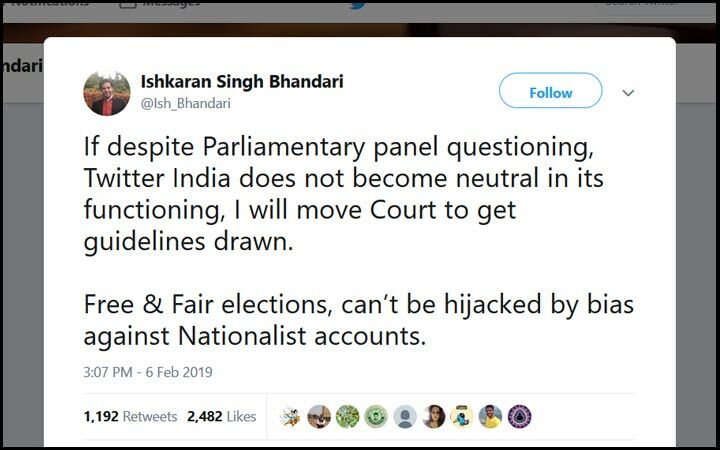 “Discussions with the government on this issue are currently on and nothing further can be commented at the moment till further clarity,” said a Twitter India spokesperson. The House panel has summoned Twitter India along with representatives from the Ministry of Electronics and Information Technology (Meity) for the meeting to examine the issue of ‘safeguarding citizens rights on social media/online news platforms’. The Indian government has also formulated new IT guidelines where social media platforms have to remove within 24 hours any unlawful content that can affect the ‘sovereignty and integrity of India’ – which has not gone down well with them. The message from the Twitter hearing will decide how Facebook and Google will later fall in line, at a time when governments the world over are gathering courage to protect the sovereignty and integrity of their citizens on social media platforms.